In late 1999, a bunch of my officemates and myself decided that our company, Hypercosm, was missing something. Something important. Nerf weapons. A quick trip to the local emporium of mass market goods (Wal-Mart) over a lunch break corrected the problem. There, we discovered that Nerf weaponry had advanced since our childhood. 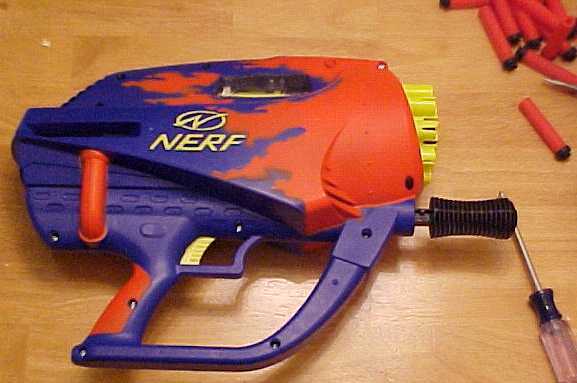 Nerf had gotten high tech. The crowning piece is the Nerf Wildfire, an absolutely vicious gun. The Wildfire's circular front chamber holds 20 nerf darts. Once pumped up (taking a good minute to do), and loaded (taking several more minutes), the darts can be fired in small bursts or in one volley of Nerfy destruction. For a Nerf weapon, it is very accurate, a two foot spread at twenty yards is common. For inter-cubical warfare, the Wildfire is an excellent weapon. The only downside is that releading it is very slow, meaning you might want a small Nerf sidearm to follow up the initial volley. Anyway, by late December, my Wildfire had started malfunctioning. In particular, when fully charged it would only fire about half of the darts before needing to be pumped up again. This was clearly unacceptable. So on January 5, 2000, I finally remembered to take my gun home and fix it. This also gave me an opportunity to play with my new digital camera. Thus, this page was born. Perhaps if you're interested in disassembling your own Wildfire, or want to see how one works without opening your own, this will help. I'm happy to say that the Wildfire is a well designed gun. It's easy to disassemble and repair. All screws involved are identical, making reassembly easy. The outer casing isn't glued or melted shut. The screws are standard Phillip's head with an extra long slot for using a flat-head screwdriver. A truly inspired person could probably increase its firepower, but I just wanted to fix mine. After pulling out the dozen or so screws from the side of the Wildfire, I gently pulled it apart. The small clear plastic tube at the top with a spring and yellow bit inside is what fires the jets of air that fire the darts. The big yellow bit on the right is the chamber where the dart are fired from. 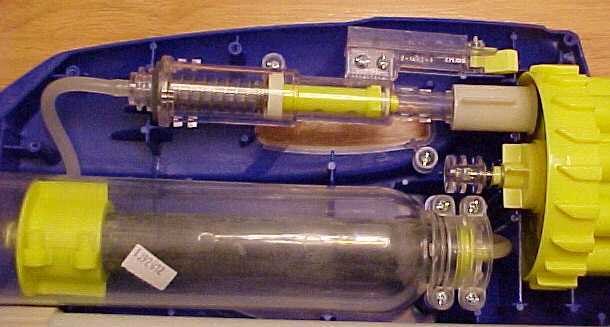 The large clear plastic tube in the middle is the compressed air storage. The white tube at the bottom is the pump. Here you can see the firing mechanism and air storage. The balloon normally is deflated like this. Pumped air inflates the balloon like so. This moves the yellow bit at the end up. This is the yellow thing you see is the "EMPTY. . . . ...FULL" gauge on the side of the closed gun. 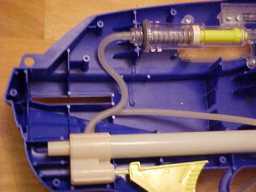 At the end of the balloon tube is a spring loaded release valve. When you attempt to overinflate the gun, the value pushed against the back of the gun and opens, releasing pressure. This is why when the gun is "full", you can't fill it any more and you hear air escaping. Steven also suggested that after reinforcing the clamp with a jubilee clip, one might be able to glue the release value shut, allowing one to overinflate the balloon for more power. Neither Steven nor myself have tried this, do so at your own risk. This is the firing mechanism proper. When you pull the trigger, you open up the tube running to this mechanism. The air flows out of the balloon and into this. If you look at how the mechanism is connected to the housing, you'll see that the back is connected to the housing while "front" (actually, the majority of the mechanism) is free to move forward. As the cylinder fills with air, pressure building, pushing the cylinder forward. This moves the yellow tab at the top forward into the gearing on the barrel. When the mechanism reaches full extent, the yellow plug in the middle is pulled back from the vent and the air rushes out to fire a dart. The motion of the tab pushes the barrel forward one notch. This repeats while there is air pressure left and the trigger is held. This little piece of plastic sits of the end of the firing mechanism and spilts the air burst into two holes. This align with the inner and outer holes on the chamber of darts. At any given moment only an inner or outer hole is exposed and a single dart fired. Here is the chamber for the darts. The holes in the back connect to the slots for the darts. (The darker holes are screw holes holding it together.) It's here that the splitter emits bursts of air. 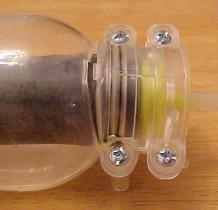 The metal and clear plastic "axle" in the back are the actual connection to the housing. 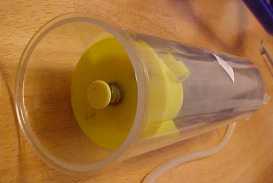 There is a spring between this shaft and the pair of yellow plastic "washers" sitting against the barrel. 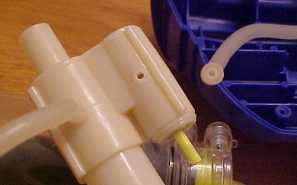 The outer washer is also connected to the housing. The washers are toothed in such a way as to make rotating one direction easier than the other. 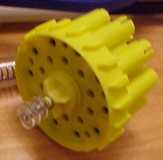 The spring pushes the washers together, making it hard for the barrel to rotate unless an external force (like the yellow tab) forces it. It's this pair of washers that are clicking and providing resistance when you twish the barrel with your hands. Here is the problem with my gun. 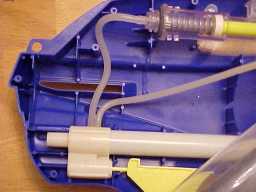 The pump/trigger mechanism has two hoses attached to it. One sends air from the pump to the balloon. When the trigger is pulled, air comes back from that tube and out the other into the firing mechanism. Here you can see that one of my tubes (the one to firing mechanism) has broken off. A generous dab of a gel super-glue fixed it right up. In my haste to test my repair, I incorrectly assembled by gun the first time. There are two cables inside of the gun that need to be placed correctly. 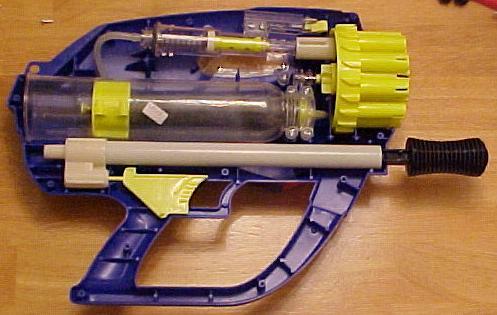 Here is the gun, mostly assembled (The balloon tube has been pulled out of the way so you can see). On the left is how not to place the tube, on the right is the correct way to place it. July 19, 2000 - Added information on how the firing mechanism and barrel rotation works. system. Corrected details on the air splitter. These changes are based on an email from Michael Wrightly. Thanks for the information Michael. Also added information on the yellow washers on the barrel. August 30, 2000 - Added information on fragile air resevoir clamp from Steven Shipway. Thanks Steven.